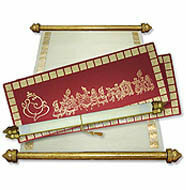 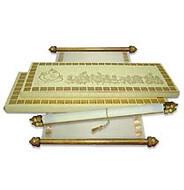 Description: A cream tissue material scroll with gold foiling border is attached to golden stick and knobs on the sides. 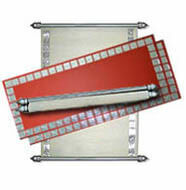 The scroll is rolled into a red texture design card box with gold border foiled on all sides and also has Inserts of the same red textured material to print the text for the additional information. 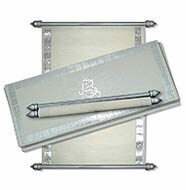 It has a matching envelope in box form with same border on the sides.